When the iconic Four Seasons decided to open their first hotel in Russia, one might have expected them to head to the capital city of Moscow. But instead, they chose majestic St. Petersburg, the intellectual and cultural center of Russia, a stunningly beautiful city filled with extravagant historical palaces, cathedrals and royal gardens. 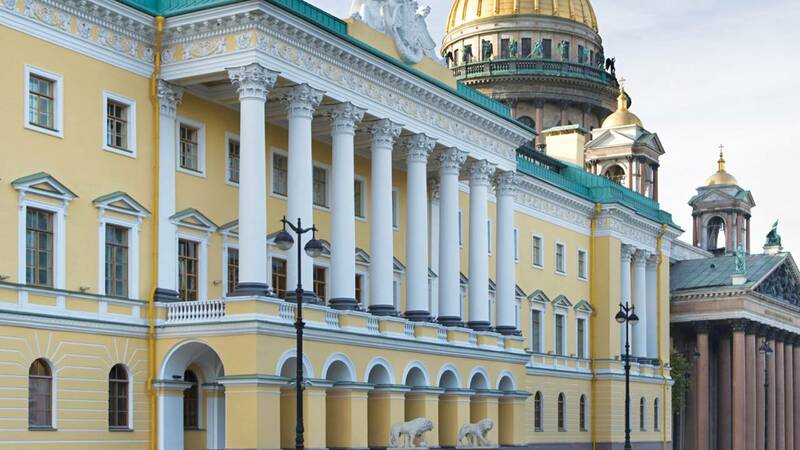 Last year, the Four Seasons Hotel Lion Palace St. Petersburg welcomed their first guests through palace doors guarded by twin marble lions, immortalized in Alexander Pushkin’s poem, The Bronze Horseman. Designed in 1820 by French architect Auguste de Montferrand, as an exclusive residence for Princess Lobanova-Rostovskay, the “Lion Palace” is now the city’s first luxury hotel. 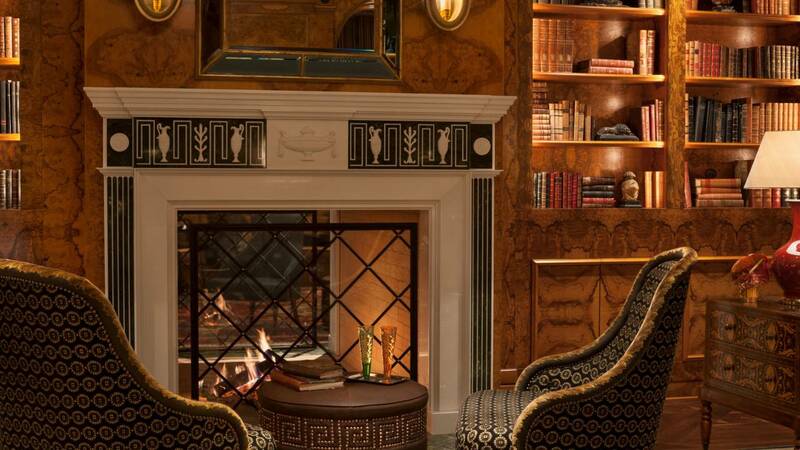 Four Seasons spent years painstakingly restoring the hotel back to its former palatial glory. 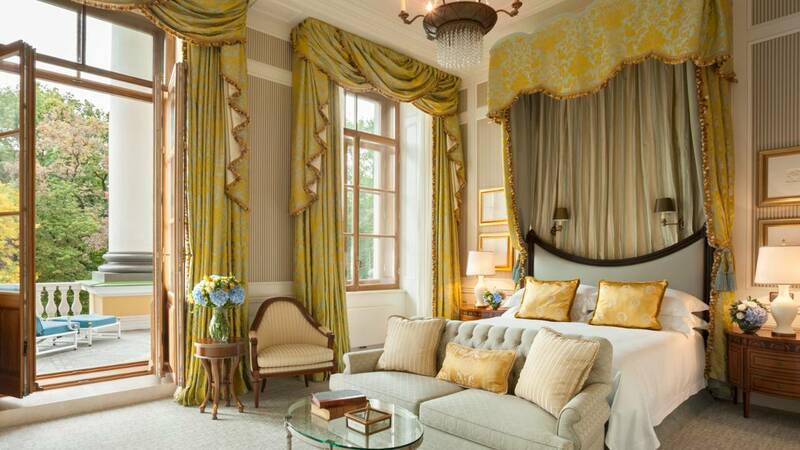 The sumptuous, imperial golden yellow and sky blue guest suites leave you feeling like Russian royalty, as you snuggle under the down-filled comforter or watch tv while soaking in a deep tub filled with Bulgari bubbles. Other welcome amenities include LCD TVs hidden behind the mirrors, DVD players, an illy espresso machine, iPod docking station and free Wi-Fi access. “Years of meticulous restoration and perfecting of the guest experience are setting the stage for a new era of style and luxury in St. Petersburg,” says Christopher Norton, who is President – Europe, Middle East and Africa for Four Seasons Hotels and Resorts. A prime example of “perfecting the guest experience” is the addition of an intimate four-level spa, with a glass topped relaxation pool, 24-hour fitness club, 8 treatment rooms and a traditional Russian steam room complete with birch branches to stimulate the skin. 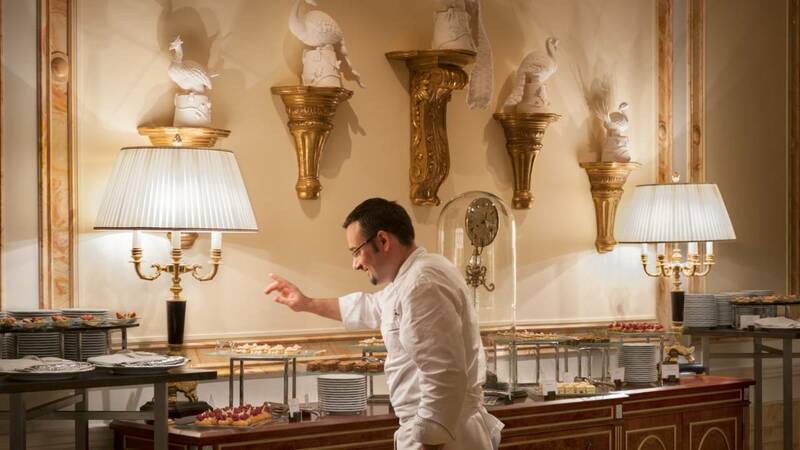 But perhaps their most inspired move was hiring Michelin-starred, Executive Chef Andrea Accordi, who is wowing both sophisticated locals and international guests with his creative twists on Russian cuisine. This is a good thing, since Accordi has big shoes to fill- his own! After four years as Executive Chef at Four Seasons Hotel Prague, he became the first chef to receive a Michelin star in all of Eastern Europe. Accordi places a priority on utilizing fresh local and sustainable ingredients at all the hotel’s eateries: Percorso Restaurant, which specializes in fine Italian cuisine, pan-Asian Sintoho Restaurant, the stylish, walnut-paneled Xander Bar, and the glass-domed, garden-like Tea Lounge, where I (over) indulged myself every morning on Accordi’s ethereal blinis and caviar offered at the exquisite breakfast buffet. 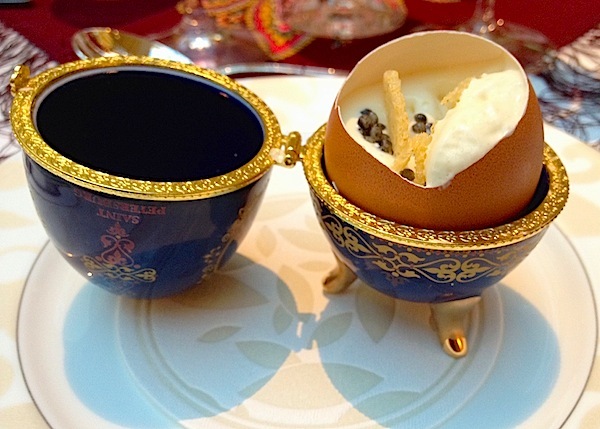 Our last night we were treated to an unforgettable Chef’s dinner, where we were completely blown away by Accordi’s imaginative interpretations and beautiful presentations- such as a delicate potato foam and caviar dish served in at Fabergé -styled egg. Other standouts included a sublime Olivier Salad, embellished with quail and crayfish, hollowed-out green apples that served as vessels for the beet borsch and commonplace pickled herring. This was elevated to the heavens with beetroot foam and grain mustard ice cream. 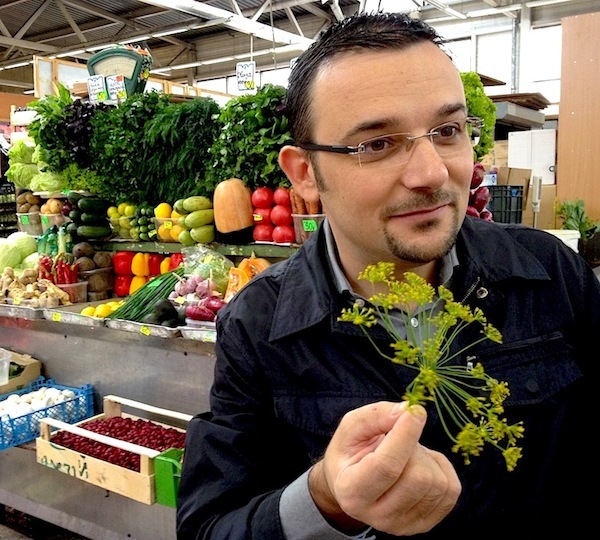 Not only does Accordi consistently delight guests with his inspired cuisine, but he is also passionate about “paying it forward” by training local Russian chefs, as he was once trained himself. “It will be a long and enthusiastic process. But by setting high standards and training well, we’ll grow together as a team” explains Accordi. * During your visit, ask if you can join this engaging chef while he shops for the best, freshest ingredients at the morning farmer’s market. 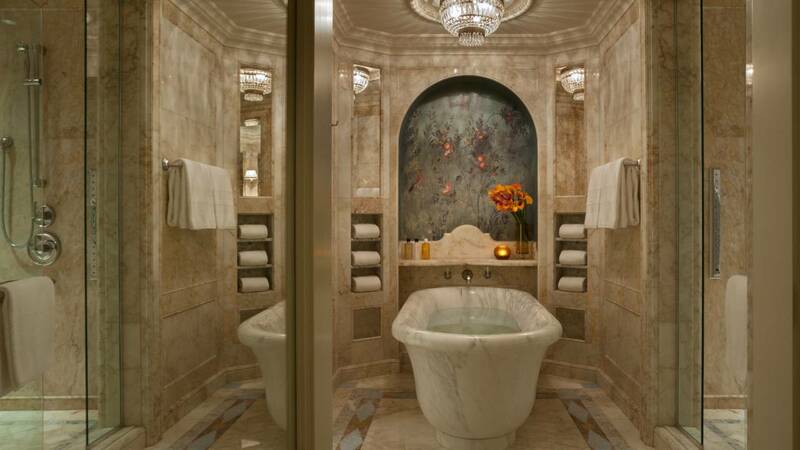 * For a memorable splurge, reserve the impressive, 1,636-square-foot, Lobanov Presidential Suite, with a private furnished terrace, an exquisite hand-painted ceiling fresco above and a deep bathtub carved from a single slab of marble. 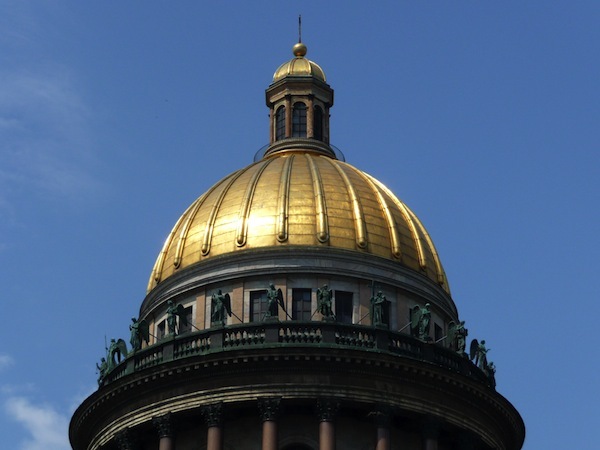 * Across the street is St. Isaac’s Cathedral (also designed by Auguste de Montferrand), the third largest cathedral in the world, capped by a shimmering dome made from 100 kilos of gold! Climb the stairs for the best birds-eye view of the hotel and St. Petersburg.